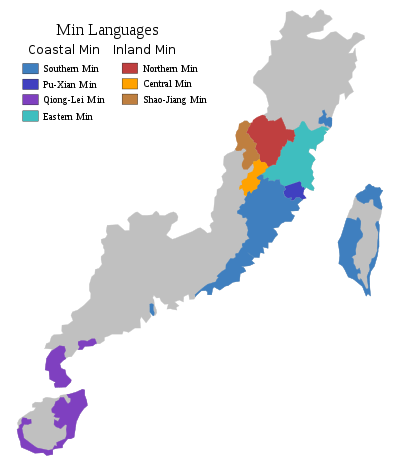 Distribution of Min languages in Taiwan and China. Min or Miin[lower-alpha 1] (simplified Chinese: 闽语; traditional Chinese: 閩語; pinyin: Mǐn yǔ; Pe̍h-ōe-jī: Bân gú; BUC: Mìng ngṳ̄) is a broad group of Chinese varieties spoken by over 70 million people in the southeastern Chinese province of Fujian as well as by migrants from this province in Guangdong (around Chaozhou-Swatou, or Chaoshan area, Leizhou peninsula and Part of Zhongshan), Hainan, three counties in southern Zhejiang, Zhoushan archipelago off Ningbo, some towns in Liyang, Jiangyin City in Jiangsu province, and Taiwan. The name is derived from the Min River in Fujian. Min varieties are not mutually intelligible with any other varieties of Chinese. There are many Min speakers among overseas Chinese in Southeast Asia. The most widely spoken variety of Min outside Fujian is Hokkien (which includes Taiwanese and Amoy). Min is usually described as one of seven or ten groups of varieties of Chinese but has greater dialectal diversity than any of the other groups. The varieties used in neighbouring counties, and in the mountains of western Fujian even in adjacent villages, are often mutually unintelligible. Early classifications, such as those of Li Fang-Kuei in 1937 and Yuan Jiahua in 1960, divided Min into Northern and Southern subgroups. However, in a 1963 report on a survey of Fujian, Pan Maoding and colleagues argued that the primary split was between inland and coastal groups. A key discriminator between the two groups is a group of words that have a lateral initial /l/ in coastal varieties, and a voiceless fricative /s/ or /ʃ/ in inland varieties, contrasting with another group having /l/ in both areas. Norman reconstructs these initials in Proto-Min as voiceless and voiced laterals that merged in coastal varieties. Although coastal varieties can be derived from a proto-language with four series of stops or affricates at each point of articulation (e.g. /t/, /tʰ/, /d/, and /dʱ/), inland varieties contain traces of two further series, which Norman termed "softened stops" due to their reflexes in some varieties. Coastal varieties also feature some uniquely Min vocabulary, including pronouns and negatives, where inland varieties use forms cognate with vocabulary in Hakka and Yue. All coastal varieties have complex tone sandhi systems, whereas inland varieties have little or no tone sandhi. Southern Min (Min Nan) originates from the south of Fujian and the eastern corner of Guangdong. In common parlance, Southern Min usually refers to Hokkien, of which the two major poles are the Amoy dialect of Xiamen and Taiwanese Hokkien of Taiwan. Zhenan Min of Cangnan County in southern Zhejiang is also of this type. Related Hokkien varieties are spoken in Chinese communities spread across Southeast Asia. The Teochew and Shantou dialects of the Chaoshan region of eastern Guangdong have difficult mutual intelligibility with the Amoy dialect. Chaoshan varieties are also spoken by most Thai Chinese. Pu-Xian Min is spoken in the city of Putian and the county of Xianyou County. Li Rulong and Chen Zhangtai examined 214 words, finding 62% shared with Quanzhou dialect (Southern Min) and 39% shared with Fuzhou dialect (Eastern Min), and concluded that Pu-Xian was more closely related to Southern Min. Eastern Min (Min Dong), centered around the city of Fuzhou, the capital of Fujian province, with Fuzhou dialect as the prestige form. Northern Min (Min Bei) is spoken in Nanping prefecture in Fujian, with Jian'ou dialect taken as typical. Central Min (Min Zhong), spoken in Sanming prefecture. Shaojiang Min, spoken in the northwestern Fujian counties of Shaowu and Jiangle, were classified as Hakka by Pan and his associates. However, Jerry Norman suggested that they were inland varieties of Min that had been subject to heavy Gan or Hakka influence. Leizhou Min, spoken on the Leizhou Peninsula in southern Guangdong, had previously been included in Southern Min. 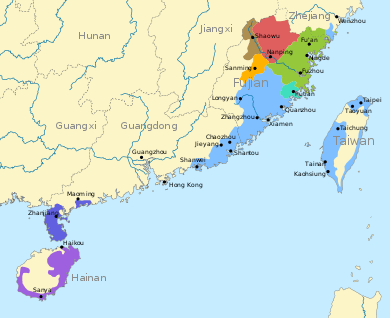 Hainanese, spoken on the island of Hainan, had also previously been included in Southern Min. These dialects feature drastic changes to the initial consonants, including a series of implosives, that have been attributed to contact with the Tai-Kadai and Austroasiatic languages spoken on the island. When using Chinese characters to write a non-Mandarin form, standard practice is to use characters that correspond etymologically to the words being represented, and to invent new characters for words with no evident ancient Chinese etymology or in some cases for alternative pronunciations of existing characters, especially when the meaning is significantly different. Written Cantonese has carried this process out to the farthest extent of any non-Mandarin variety, to the extent that pure Cantonese vernacular can be unambiguously written using Chinese characters. Contrary to popular belief, a vernacular written in this fashion is not in general comprehensible to a Mandarin speaker, due to significant changes in grammar and vocabulary and the necessary use of large number of non-Mandarin characters. A similar process has never taken place for any of the Min varieties and there is no standard system for writing Min, although some specialized characters have been created. Given that Min combines the Chinese of several different periods and contains some non-Chinese vocabulary, one may have trouble finding the appropriate Chinese characters for some Min vocabulary. In the case of Taiwanese, there are also indigenous words borrowed from Formosan languages, as well as a substantial number of loan words from Japanese. The Min spoken in Singapore and Malaysia has borrowed heavily from Malay and, to a lesser extent, from English and other languages. The result is that cases of Min written purely in Chinese characters does not represent actual Min speech, but contains a heavy mixture of Mandarin forms. Attempts to faithfully represent Min speech necessarily rely on romanization, i.e. representation using Latin characters. 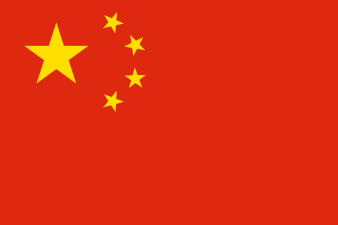 Some Min speakers use the Church Romanization (Chinese: 教會羅馬字; pinyin: Jiaohui Luomazi). For Hokkien the romanization is called Pe̍h-ōe-jī (POJ) and for Fuzhou dialect called Bàng-uâ-cê (BUC). Both systems were created by foreign missionaries in the 19th century (see Min Nan and Min Dong Wikipedia). There are some uncommon publications in mixed writing, using mostly Chinese characters but using the Latin alphabet to represent words that cannot easily be represented by Chinese characters. ↑ Norman (1991), pp. 328. ↑ Norman (1988), pp. 210, 228. ↑ Ting (1983), pp. 9–10. ↑ Baxter & Sagart (2014), pp. 33, 79. ↑ Yan (2006), p. 120. ↑ Norman & Mei (1976). ↑ Norman (1991), pp. 331–332. ↑ Norman (1991), pp. 334–336. ↑ Norman (1991), p. 336. ↑ Norman (1991), p. 337. ↑ Norman (1988), p. 188. ↑ Kurpaska (2010), p. 49. 1 2 3 4 Norman (1988), p. 233. ↑ Branner (2000), pp. 98–100. ↑ Norman (1988), pp. 228–230. ↑ Branner (2000), pp. 100–104. ↑ Norman (1988), pp. 233–234. ↑ Norman (1988), p. 239. 1 2 Kurpaska (2010), p. 52. ↑ Norman (1988), pp. 232–3. ↑ Li & Chen (1991). ↑ Kurpaska (2010), p. 71. ↑ Norman (1988), pp. 235, 241. ↑ Lien (2015), p. 169. Bodman, Nicholas C. (1985), "The Reflexes of Initial Nasals in Proto-Southern Min-Hingua", in Acson, Veneeta; Leed, Richard L., For Gordon H. Fairbanks, Oceanic Linguistics Special Publications, 20, University of Hawaii Press, pp. 2–20, ISBN 978-0-8248-0992-8, JSTOR 20006706. Branner, David Prager (2000), Problems in Comparative Chinese Dialectology — the Classification of Miin and Hakka, Trends in Linguistics series, 123, Berlin: Mouton de Gruyter, ISBN 978-3-11-015831-1. Li, Rulong 李如龙; Chen, Zhangtai 陈章太 (1991), "Lùn Mǐn fāngyán nèibù de zhǔyào chāyì 论闽方言内部的主要差异" [On the main differences between Min dialects], in Chen, Zhangtai; Li, Rulong, Mǐnyǔ yánjiū 闽语硏究 [Studies on the Min dialects], Beijing: Yuwen Chubanshe, pp. 58–138, ISBN 978-7-80006-309-1. Lien, Chinfa (2015), "Min languages", in Wang, William S.-Y. ; Sun, Chaofen, The Oxford Handbook of Chinese Linguistics, Oxford University Press, pp. 160–172, ISBN 978-0-19-985633-6. Norman, Jerry (1973), "Tonal development in Min", Journal of Chinese Linguistics, 1 (2): 222–238, JSTOR 23749795. —— (1991), "The Mǐn dialects in historical perspective", in Wang, William S.-Y., Languages and Dialects of China, Journal of Chinese Linguistics Monograph Series, 3, Chinese University Press, pp. 325–360, JSTOR 23827042, OCLC 600555701. Ting, Pang-Hsin (1983), "Derivation time of colloquial Min from Archaic Chinese", Bulletin of the Institute of History and Philology, 54 (4): 1–14. Yue, Anne O. (2003), "Chinese dialects: grammar", in Thurgood, Graham; LaPolla, Randy J. (eds. ), The Sino-Tibetan languages, Routledge, pp. 84–125, ISBN 978-0-7007-1129-1.